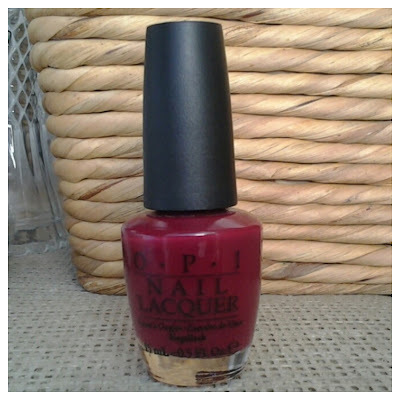 What I Blog About When I Blog About Books: NOTD: OPI "Just A Little Rosti At This"
Today's notd is another old polish. 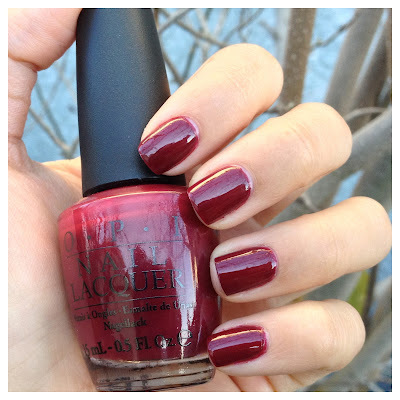 OPI's "Just A Little Rosti At This" has been a reliable deep red for the past couple winters. It deep wine red color with a slight hint of berry in it. It's perfect for those days that I'm in the mood for the color that isn't quite as purple as a berry color, but not quite as dark as a blood red shade (and yes, those moods do exist for me). This polish is my go-to. The formula on this polish is decent, but not great. It takes about 2-3 coats to reach opacity. Neither too sheer or streaky, not amazingly opaque. Well, that was today's notd. I apologize for my boring polish choices this week. I guess I have just been in the mood for dark creams and trying to get some good use out of my reliable dark creams before spring approaches. Ooooooooo. That color is gorgeous! I love how dark polish looks on your nails! Apologies if I kept gazing at your hands too much today. haha, I honestly didn't notice. But thanks!